In this post is given a Jaldi Ya Shighra Shadi Karne Ka Shabar Mantra or a Shabar Vidya Mantra for getting married quickly. This Mantra is especially meant for people who are finding it very difficult to find a suitable life partner for marriage. The Mantra includes the names of the Mother Goddess Mahakali and the Great Nath Guru Gorakhnath. Shabar Mantras are very different from other traditional or conventional Mantras and the wordings of Shabar Mantras are difficult for most people to understand properly. This is the main reason why Shabar Mantras confuse a lot of people. Shabar Mantras are said to give quicker results and are more flexible than other traditional Hindu Mantras and this is the reason why there are more than one version of the same Shabar Mantra with slight variations in the pronunciations. 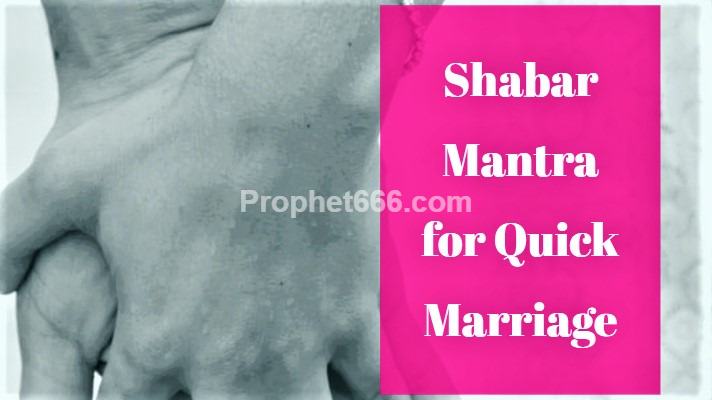 There is no Vidhi or any kind of fixed number of Mantra Chants prescribed for this Shabar Mantra for finding a life partner quickly. Hence, those who wish to practice this Mantra can keep chanting the Mantra for a fixed period of time daily. Notes- The practitioner should chant the Mantra until he does not experience any kind of discomfort or feels comfortable. The Mantra will give the desired results, if the practitioner chants the Mantra with faith and dedication. Even though, Mahakali Mata and Guru Gorkahnath are invoked in the wordings of this Shabar Mantra, there is no need to perform any specific ritual dedicated to these deities. The practitioner can of course worship them, if he or she so desires.